Description: Studying Paul's Letters provides a survey of the most relevant current methods in Paul scholarship. Joseph A. Marchal leads a group of scholars who are also experienced teachers in courses on Paul. More than a series of "how-to" essays in interpretation, each chapter in this volume shows how differences in starting point and interpretive decisions shape different ways of understanding Paul. Each teacher-scholar focuses on what a particular method brings to interpretation and applies that method to a text in Paul�s letters, aiming not just at the beginning student but at the "tough choices" every teacher must make in balancing information with critical reflection. Studying Paul's Letters is organized for use in a single semester course on Paul and is perfect for graduate students, seminarians, and undergraduate students. Citation: Brian J. Robinson, review of Joseph A. Marchal, ed., Studying Paul's Letters: Contemporary Perspectives and Methods, Review of Biblical Literature [http://www.bookreviews.org] (2014). 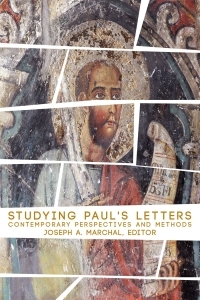 Citation: Robert N. Stegmann, review of Joseph A. Marchal, ed., Studying Paul's Letters: Contemporary Perspectives and Methods, Review of Biblical Literature [http://www.bookreviews.org] (2013).